We’re at that point – it swings around about once a decade – when lifelong learning becomes something people seem to want to talk about as if it mattered. One prompt for this in the UK is the centenary of the 1919 Report on Adult Education, on which Paul Stanistreet has written so powerfully. A Commission chaired by Dame Helen Gosh (Master of Balliol College Oxford, whose predecessor in that role chaired the original) is looking at how we might use the date to generate some fresh impetus and thinking. Both of which, plus huge amounts of political effort, are needed if we are to turn around this country’s extraordinary decline over the last decade. (I’m talking about lifelong learning only….at least for now.) Slump in overall participation in adult learning, precipitous drop in part-time learning opportunities, closure of extramural departments – these are massive retrograde steps which cannot be easily reversed – and which a few items in a supposed National Retraining Scheme are certainly nowhere near adequate to deal with. above all, inspire confidence that lifelong learning and reskilling on a society-wide scale are truly possible. It aims to do this by providing a methodology or tool that will enable both leaders and individuals to seek out ways of making successful transitions from declining occupations to growing ones. The transitions are into jobs which are a realistic enough fit to what people are currently doing, with lifelong learning an integral component of that shift. The paper comprises analysis of two very large American datasets which break occupations down in very detailed ways, covering almost 1000 different job types. It begins from the assumption that people in their current jobs hold the appropriate skills and knowledge. That may be a little questionable, but let’s grant it (see below on utilisation). The authors go on to explore the kinds of job transition that are desirable as well as feasible, ie they are into positions that involve no or little drop in wages, and are sustainable in the long-term (ie noticeably different from many of the jobs that figure in the UK’s supposed employment miracle). Some of the ‘good fit’ transitions will be to jobs within the person’s current jobs family, eg Data Entry Keyer to Medical Secretary. But many will involve a bigger leap. For example, production workers – the biggest overall losers – may be able to move to be robotics technicians, but this involves a greater level of new skill acquisition. The authors play with interesting and relevant variables, such as different periods of experience and learning time. The paper produces some very specific pathway options. I reproduce one of these below, for secretaries and admin assistants. This justifies its claim to be a practical tool as well as a valuable analysis. There is a strong gender dimension, making the paper relevant to the Paula Principle. On the one hand it suggests that a larger proportion – 57% – of those who will need to shift occupations will be women. (The proportion is the same whether the requirement to move to a job at the same wage level is imposed or relaxed.) On the other hand the range of transitions projected to be associated with wage increases is larger for women than for men, so the authors foresee a natural impetus for greater wage equality. Current discussions of the future of work have often emphasized the urgency of reskilling and life-long learning. Yet, few approaches exist to help identify productive ways of planning job transitions that can minimize strain on companies’ workforce strategies, public finances and social safety nets, as well as the affected individuals themselves. 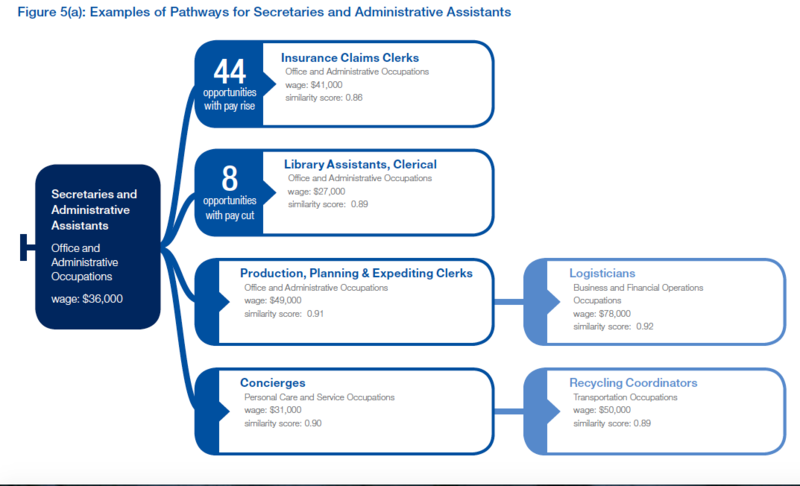 The purpose of this report has been to introduce such an approach to mapping out job transition pathways and reskilling opportunities, using the power of digital data to help guide workers, companies, and governments to prioritize their actions, time and investments on focusing reskilling efforts efficiently and effectively.